Check your tracks whenever possible. The red line indicates where many people accidentally end up. 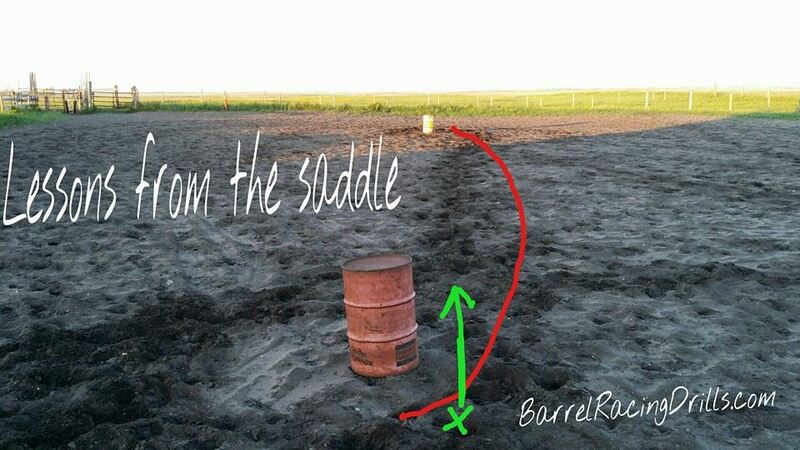 Make sure your horse is leaving the second barrel straight and strong (green line). The shortest distance between two points is a straight line, so be sure to keep your horse between your hands and legs to help him stay on the line. Look up over his ears and send him up into that third barrel turn as efficiciently as possible. Giving your horse adequate room going deep into second will give him the room to leave it straight. Coming into second too soon is one of the most common causes of that arc out of second and on to third. 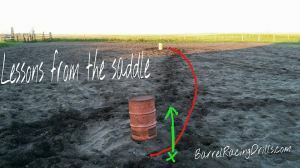 How you leave the barrel is directly related to how you approached it. I have. Finished barrel horse and I’m lost for words.He has been going past the first barrel and hitting second barrel.Ive done slow work and also trott him around the barrels he does great but when I add speed is when he acts up. I would take your horse to the vet and have a soundness evaluation done first. You may also consider an Equine Therapist. Someone who can do massage and muscle releases. I would take your horse to the vet and have a soundness evaluation done first. You may also consider an Equine Therapist. Someone who can do massage and muscle releases. 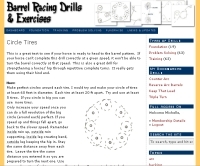 You may also consider having an professional barrel racer assess your situation in person. Sometimes another set of eyes can help pick out some problems with your body positioning that are contributing to the problem.